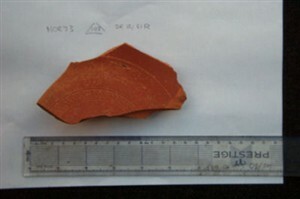 Northchurch Roman Villa | The Dacorum Heritage Trust Ltd.
A fragment of Samian pottery found at the Northchurch site. 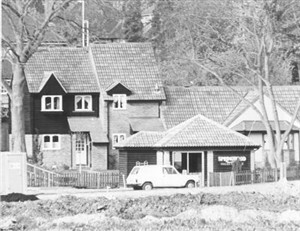 Berkhamsted and District and Archaeology Society cared for by the Dacorum Heritage Trust Ltd.
Northchurch Roman Villa was rediscovered by the Berkhamsted and District Archaeological Society and excavated in advance of housing development during a four-week period over Easter 1973. Occupation on the site began around 60 AD, probably with a timber building. By the early second century a simple villa of four rooms with a fronting corridor and a ‘wing’ room had been built. Houses built on the site of the former Northchurch Roman Villa. A larger building of eight rooms with two ‘wing’ rooms at either end of the corridor was built. About 170 AD this building was abandoned for 40 to 50 years, probably due to the effects of flooding in the area (which is still considerably water-logged). Rebuilding sees to have taken place after 339 AD (both the Boxmoor and Gadebridge Park villas had been rebuilt in the early fourth century). A small bath suite was added to the west side; two of the rooms had mosaics and some walls were decorated with painted wall plaster. After the mid-fourth century the villa ceased to be maintained and associated remains were found which appear to indicate an economy based on mixed farming.